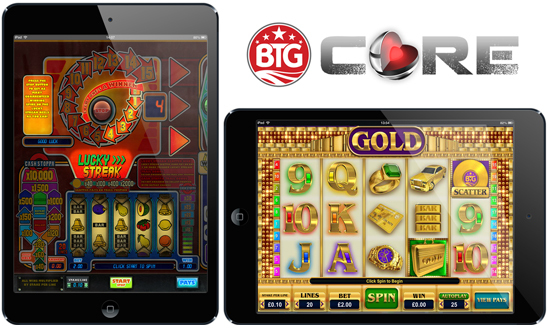 Sydney 4th December 2013 - CORE Gaming, the industry’s leading developer of HTML5 and tablet casino games, has today announced that it has signed a deal with innovative slots provider - Big Time Gaming, to deliver its latest release of desktop games to the mobile market in 2014. “Lucky Streak” slot brings to life the traditional, old school fruit machine game play and introduces great additional new features such as Win Streaks™, which gives players a set of guaranteed winning spins. The game also features a Numeric Trail Bonus which leads the ultimate 'Cash Stoppa' feature. “Gold” is a classic 20 line slot which has state of the art 3D graphics featuring flash cars, bling watches and jewels, but what makes this slot so unique is, that it’s feature is accompanied by Spandau Ballet's hit 80's anthem "Gold". Core Gaming is a leading developer of HTML 5 games specifically produced to give the very best user experience possible on all of the most popular mobile devices, operating systems and browsers currently available.